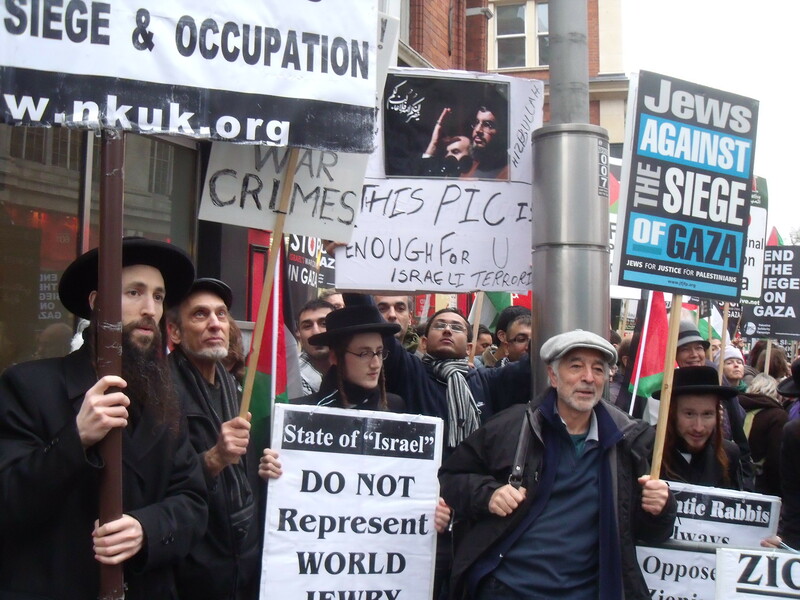 A bad week for “Britain’s powerful Israel Lobby”. IMO secretary-general Koji Sekimuzu addresses the Israeli Ambassador Daniel Taub last week. 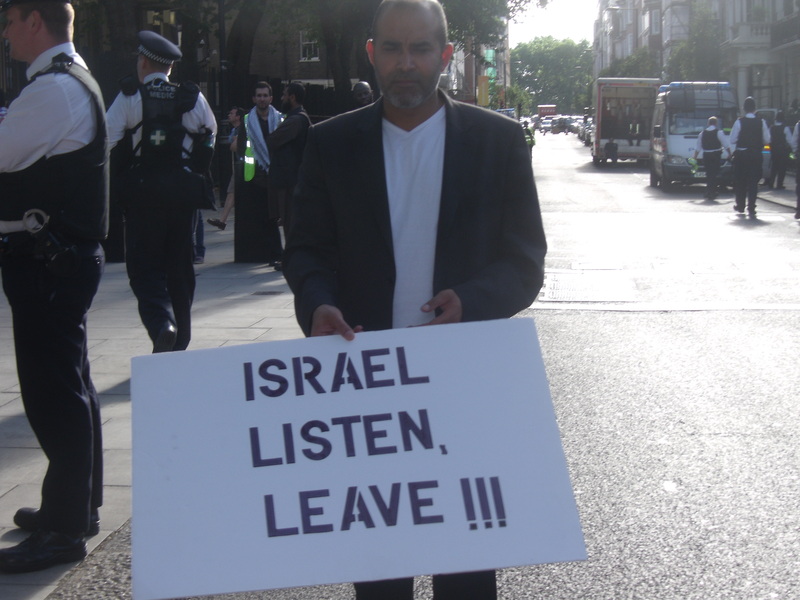 In the last few weeks accusations of Britain having a “powerful Israel Lobby” are being reiterated once again. 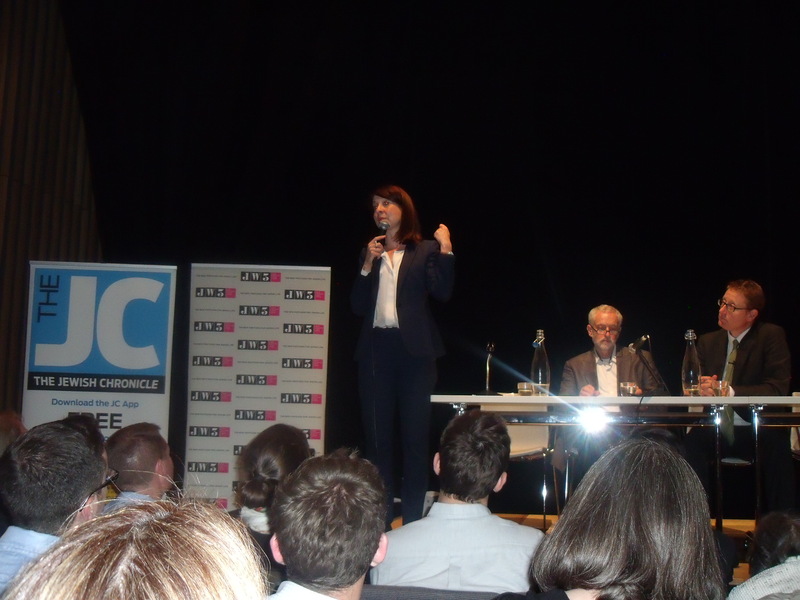 David Ward MP tweeted “shame there isn’t a powerful, well funded Board of Deputies for Roma”. This seems to be an indirect reference to the Board of Deputies of British Jews. 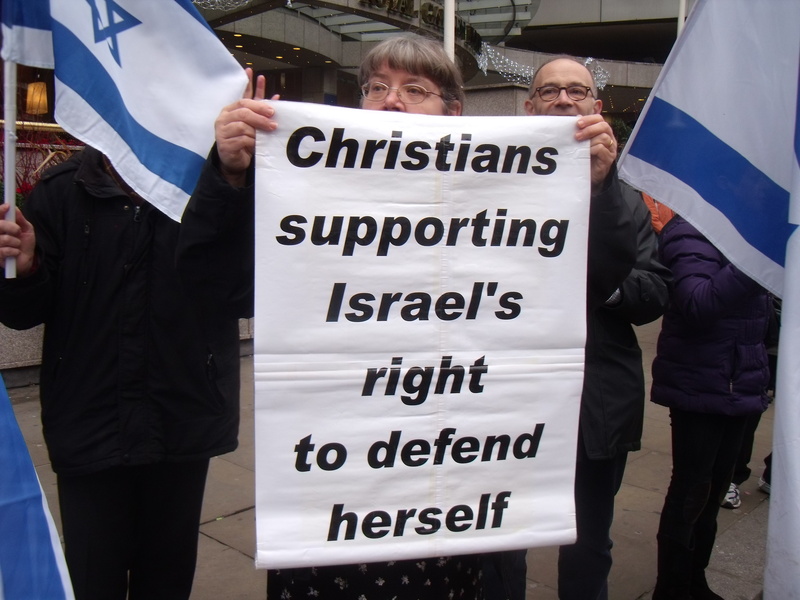 Meanwhile, in his opinion piece for the Daily Telegraph Peter Oborne described Conservative Friends of Israel as “by far Britain’s most powerful pro-Israel lobbying group”. Oborne attacks CFI for acting “as if every Jew in the country is a Likud supporter” on the basis that CFI seemed to be parroting Netanyahu’s criticisms of Iran’s interim nuclear agreement with Britain, USA, France, Russia, Germany and China. In 2009 Oborne made a documentary for Channel 4 called Inside Britain’s Israel Lobby which he introduced with the sinister line “Tonight on dispatches how British policy is influenced by supporters of a foreign power”. So I thought about how effective these lobbies actually are and the recent picture doesn’t look rosy. The irony of Oborne’s piece for the Daily Telegraph is that “by far Britain’s most powerful pro-Israel lobbying group” did not achieve for Israel what Israel had wanted, namely the total dismantling of Iran’s nuclear programme. For, let’s remember, Iran’s Supreme Leader Ayatollah Khamenei has said that “Israel is a cancer that must be removed”. No, not the “Zionist entity” or even “the Apartheid state”, but Israel, hook, line and sinker. 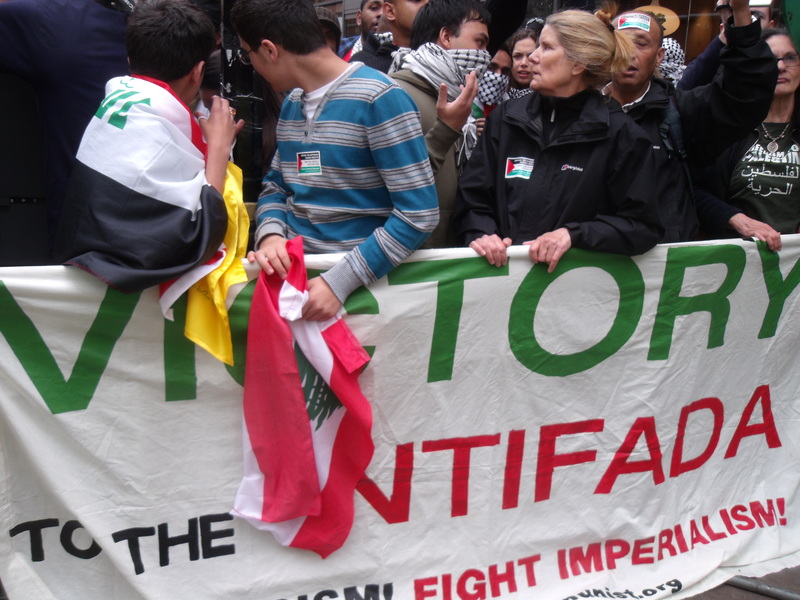 Then we discover that Britain has been carrying on behind-the-scenes negotiations with Hezbollah. 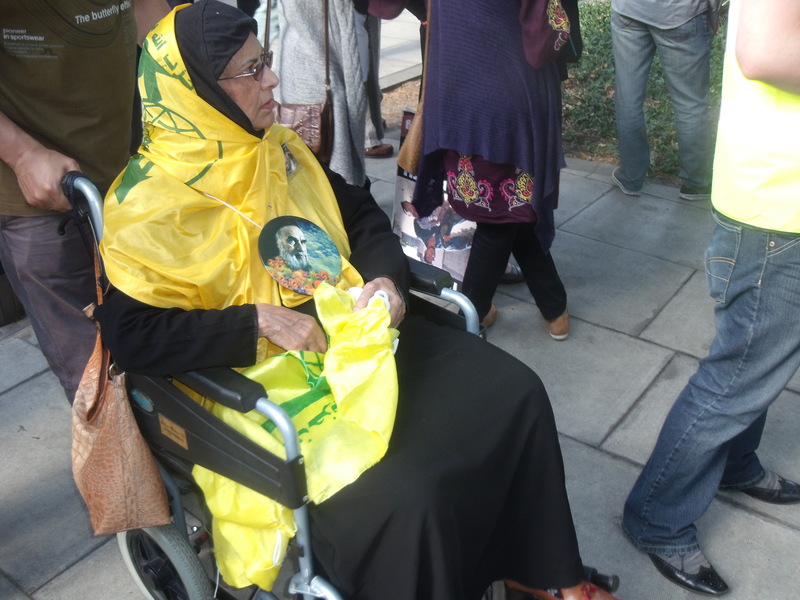 Hezbollah is Iran’s surrogate in Lebanon and Syria and is also determined to annihilate Israel. Britain, unlike America, quite unbelievably recognises Hezbollah’s political wing, despite this political wing, no doubt, directing the military wing to bomb American and Jewish targets around the world. Britain’s talks with Hezbollah were not explicitly condoned by America, which doesn’t recognise either wing of Hezbollah, but America “will listen with interest” to what is being said. Then Universities UK produced a document on preserving free speech in universities and in one section the document gives a case study on what to do in the event that any speaker is disrupted. 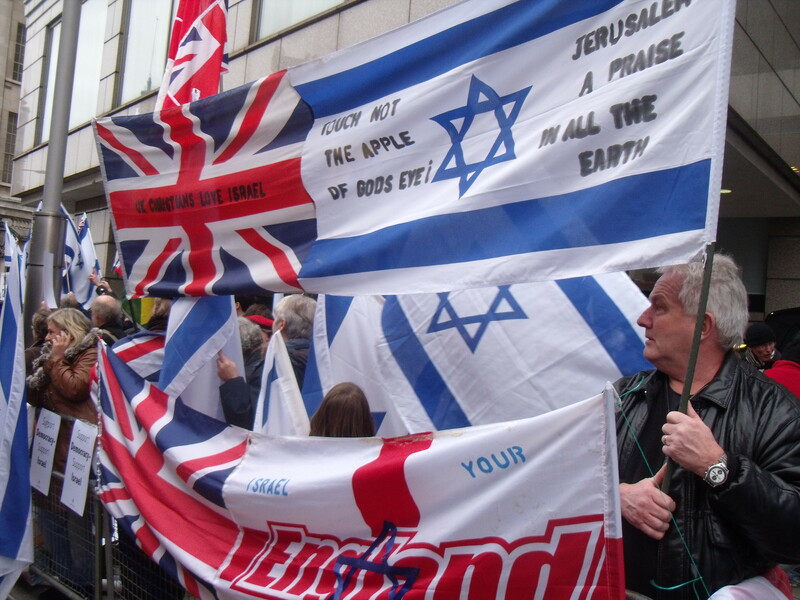 Remarkably, it is British Jews who are the transgressors in this fictional case study. 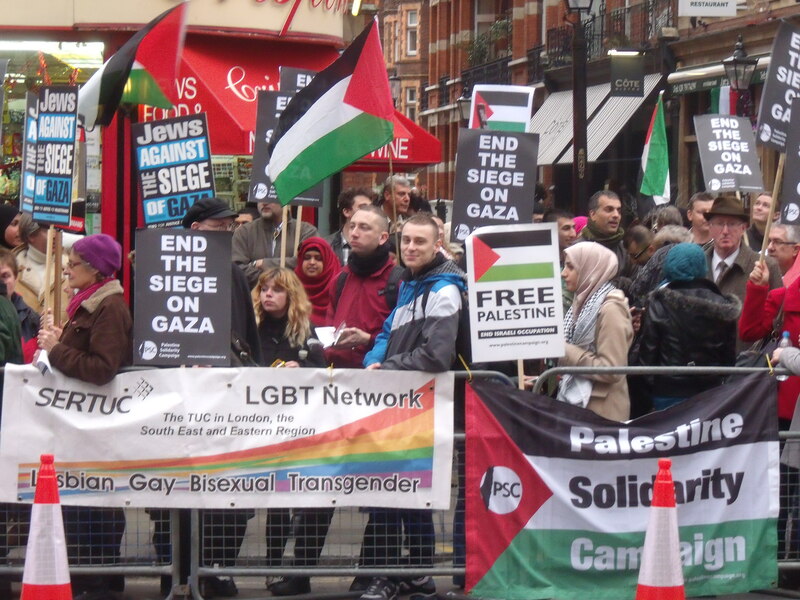 Case Study 4 “Israel and Palestine” describes how a university’s Jewish society and the local synagogue have expressed concerns about a pro-Palestinian speaker. The local Rabbi has even written to the local paper. During the event “there are concerted attempts to shout the speaker down and prevent him from speaking”. People are asked to leave and do so voluntarily (see page 30 of said document). 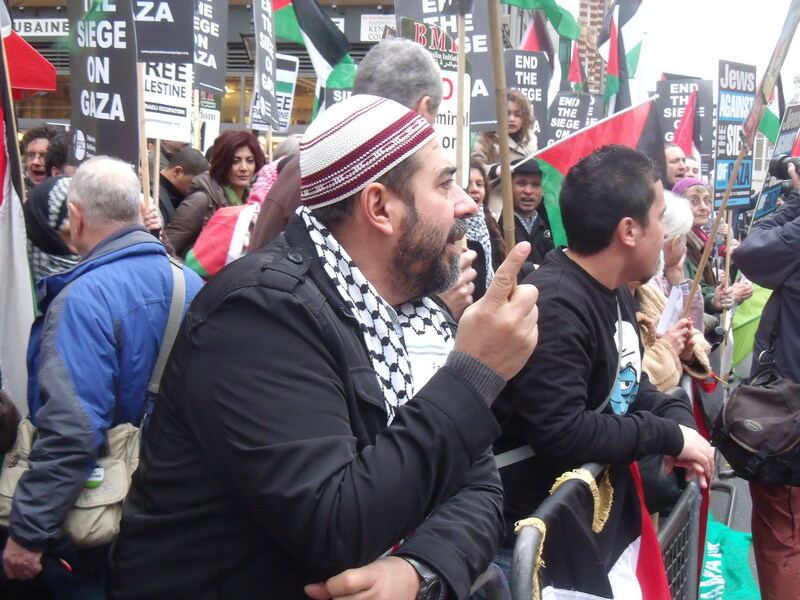 I have never heard of British Jews actually trying to prevent a pro-Palestinian speaker from speaking. 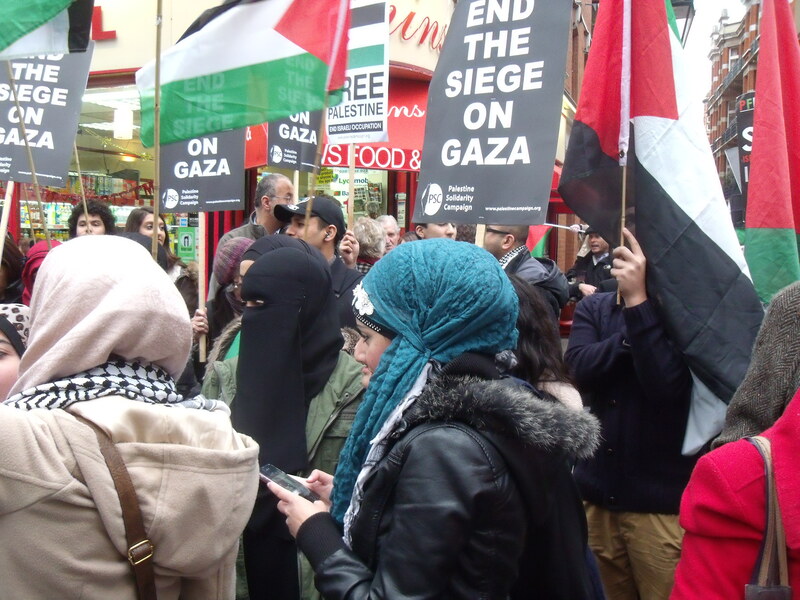 It is pro-Israel speakers who are regularly shouted down as was the case recently in Sheffield when protesters stormed the stage at the Model United Nations student conference while Israeli deputy ambassador Alon Roth-Snir was speaking. Finally, the International Maritime Organisation is currently meeting in its 28th session in London. On the agenda was the election of 40 member states to the IMO’s Council. Israel was up for election and a few days before the vote I found myself in a bar in Westminster among diplomats from various IMO member countries. 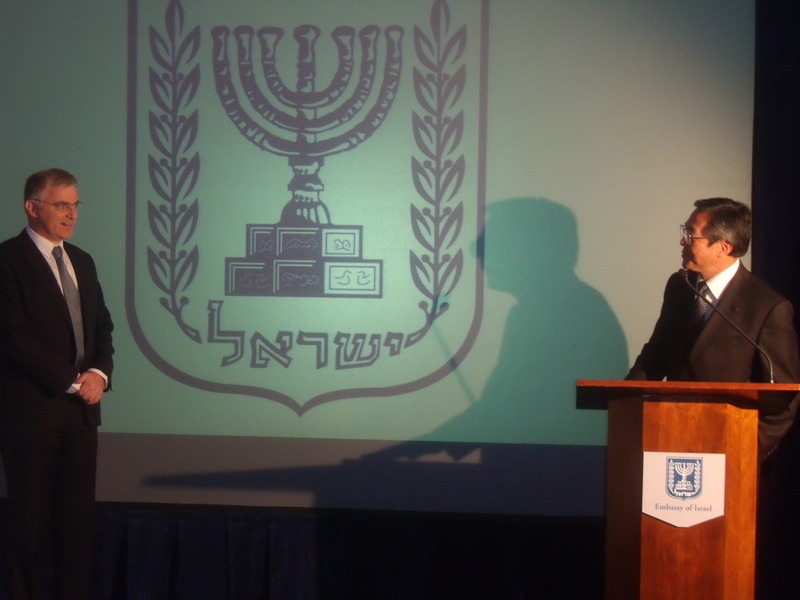 Israel’s Ambassador Daniel Taub gave a speech and the secretary-general of the Council lit the Chanukah candles. Over canapes and an endless supply of wine the idea was to mingle and sing Israel’s praises. The Bahamas delegation assured me Israel and they were voting for each other so I moved on. The Turkish delegate assured me that “there was every possibility” that he would vote for Israel. Turkey and the Bahamas were among those elected, but Israel failed despite the incredible contribution Israel can make to important seafaring issues such as security, safety and technology. 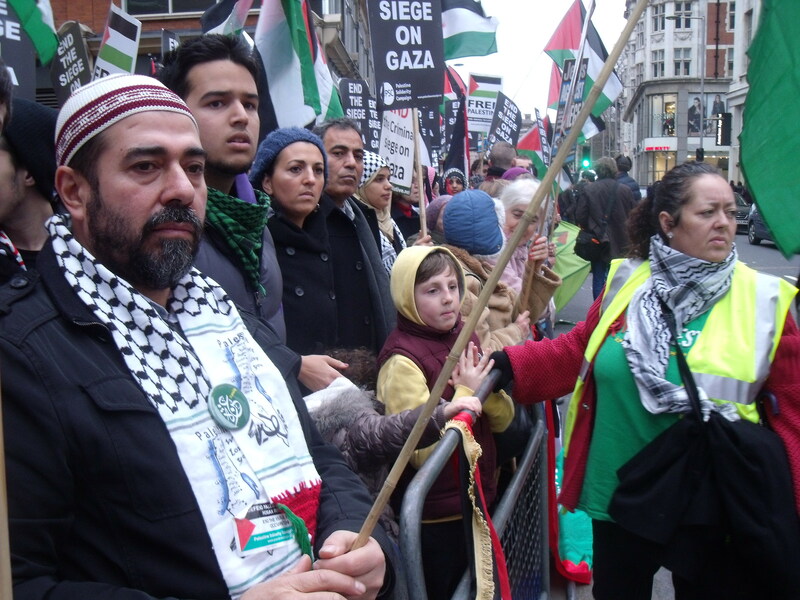 It was yet another failure chalked up by Britain’s “powerful Israel Lobby”. 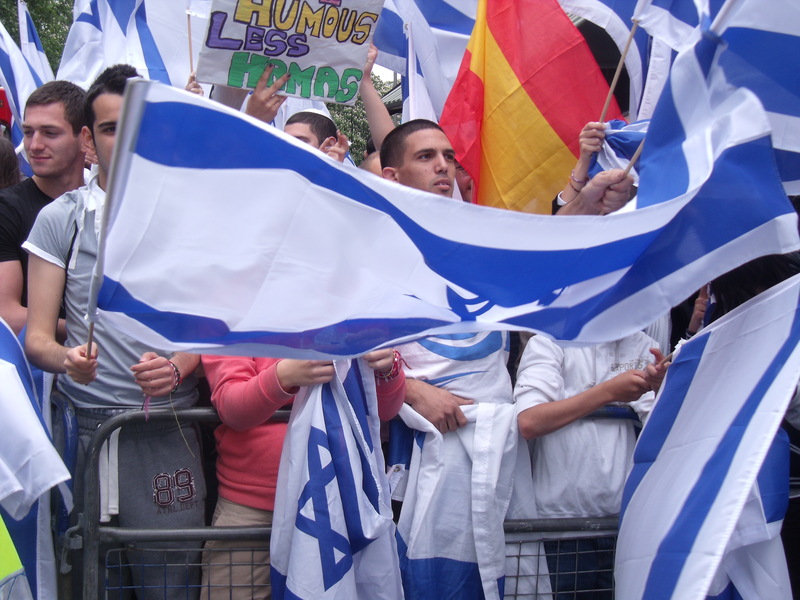 Israel’s Batsheva dances on in Edinburgh despite PSC invasions. 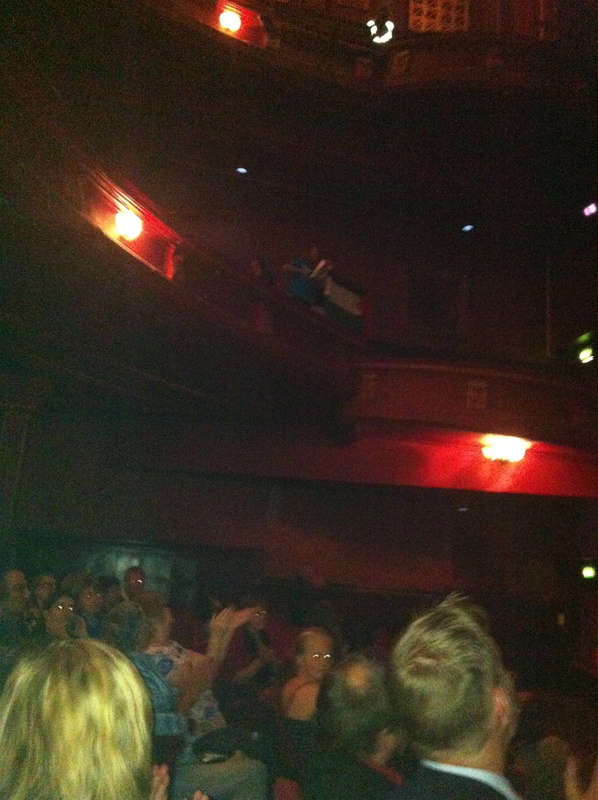 Disruption during Batsheva’s Thursday performance at Edinburgh’s Playhouse Theatre. 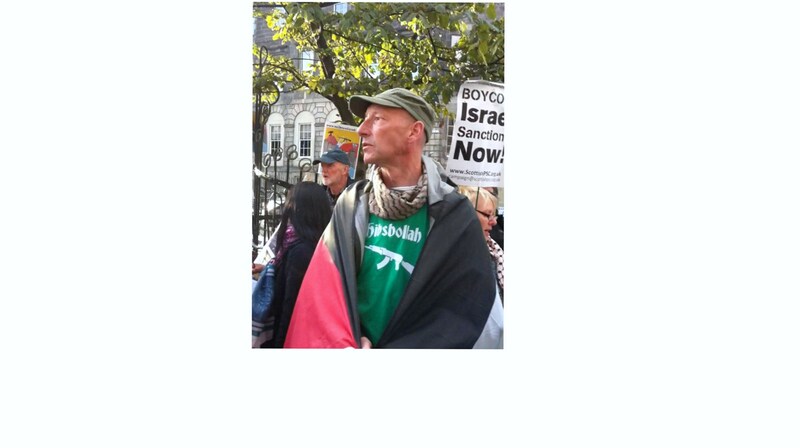 What follows is a first hand account by our good friend Harvey of the racism, lies and abuse hurled at innocent theatre-goers by the Palestine Solidarity Campaign when Israel’s Batsheva dance group performed last Thursday, Friday and Saturday at The Playhouse Theatre in Edinburgh. Harvey also highlighted the frightening lack of security inside the theatre. Disgusting specimen, eh? Such a pleasant chap that Napier. And it’s alright for Napier to have a go at members of the public out for a pleasant Thursday night’s entertainment; just don’t intimidate poor, defenceless Napier and his flock. 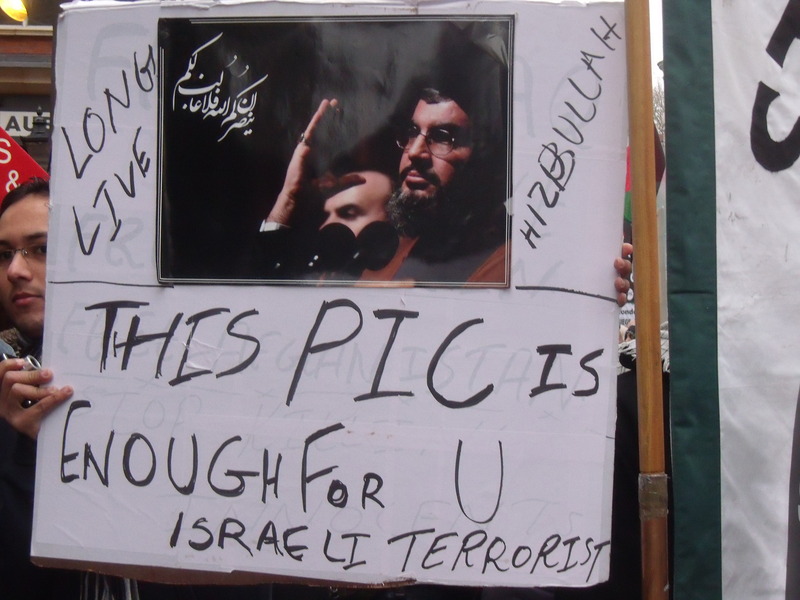 Does anyone need reminding about the exhortations of Hezbollah’s Sheikh Nasrallah who has characterised Jews as the “grandsons of pigs and apes” and has said that if every Jew gathered in Israel it would save Hezbollah the effort of going after them worldwide. And go after them worldwide they have with terrorist attacks in Argentina in 1992 and 1994 and this year in Bulgaria. Harvey reports that on entering The Playhouse the security, which consisted of a trestle table for checking bags, was “optional”. He walked in on the Thursday night without even showing his ticket, something which the PSC got wind of allowing them to run amok during the Saturday night performance and force some nine stoppages of the show. On the Thursday, Harvey reports, there were three stoppages. Each time the Batsheva dancers came into a line at the front of the stage and stood like soldiers to attention while the lights went up to allow security to evict the PSC activists. And each time the audience responded with a spontaneous standing ovation to drown out the noise of the activists. It is incredible that after the disruptions during the Israeli Philharmonic Orchestra’s performance at the Royal Albert Hall and Habima’s Merchant of Venice at The Globe there have been no prosecutions for aggravated trespass. But this will always be the case without complaints by the likes of the Royal Albert Hall, The Globe and The Edinburgh Playhouse to the police. Please come and support the wonderful dancers and help drown out the noise of the PSC’s professional disruptors. 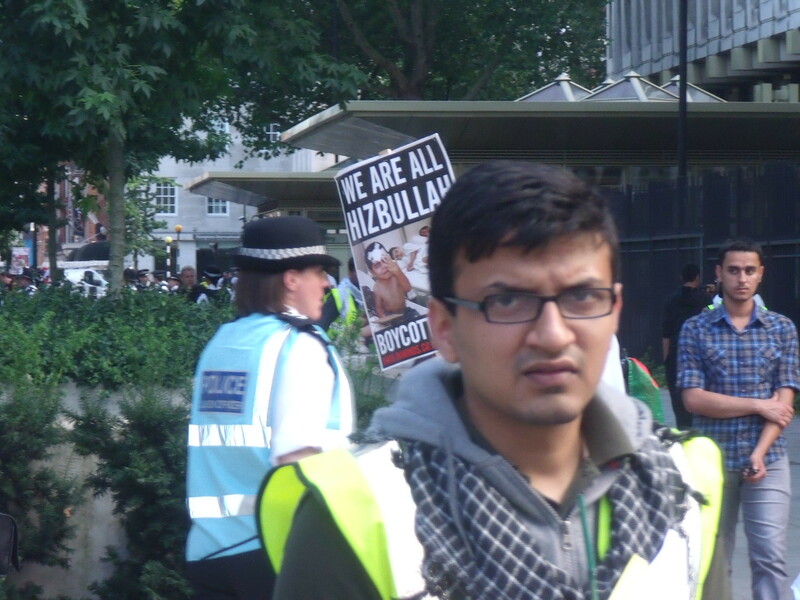 British Muslim Initiative calls for Israel’s destruction, Inshallah! 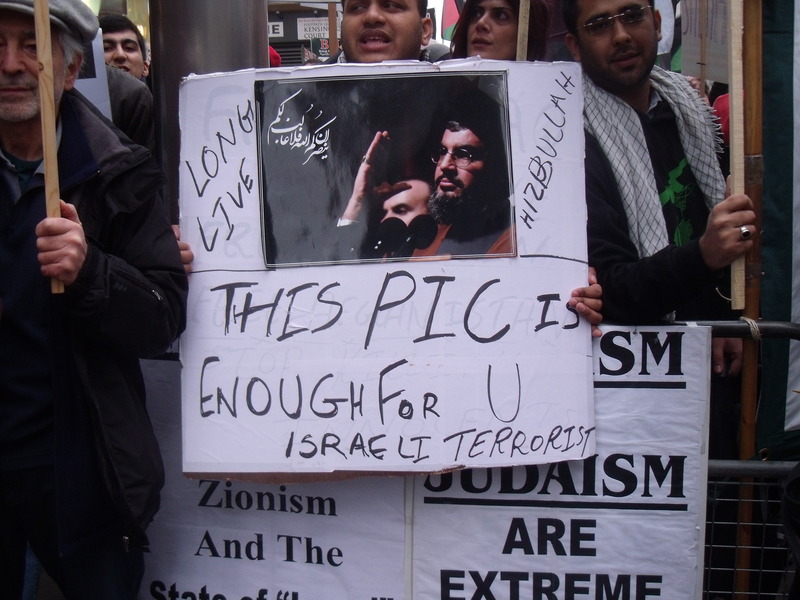 Neturei Karta pose under a photo of Hezbollah's Hassan Nasrallah in London today. 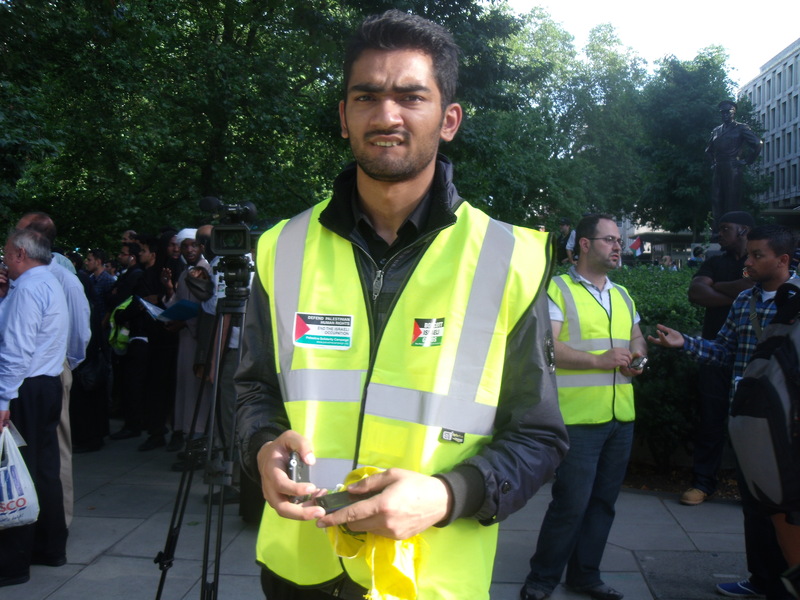 Mohammed Kozbar of the British Muslim Initiative today threatened Israel with destruction should it again take defensive action against the Hamas rockets still being fired into Israel from Gaza when he spoke on the streets of London outside the Israeli Embassy today. “Our message to them is don’t repeat the same mistake again. 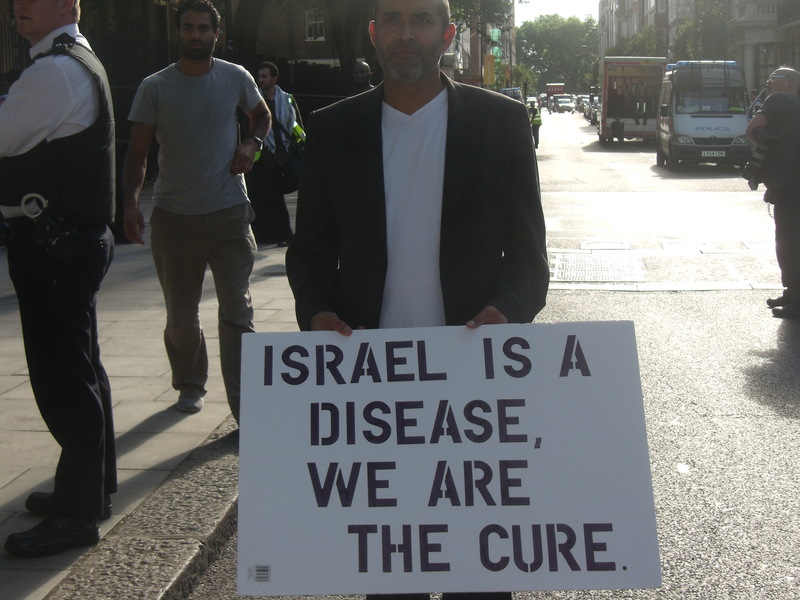 This time will be the end of Israel, Inshallah”. 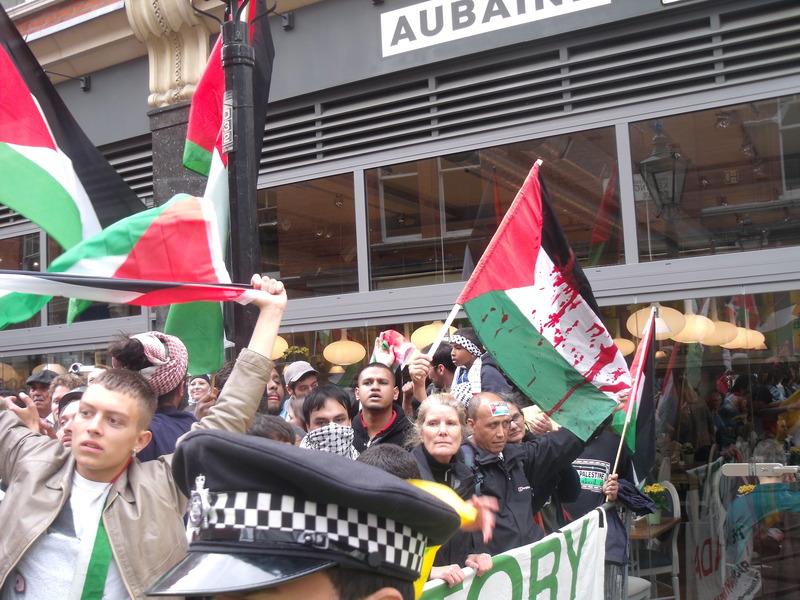 Other people spoke after Kozbar but I was told by a Constable Lines that I would be arrested for a public order offence if I continued to film close up as I was, apparently, “winding them up”. 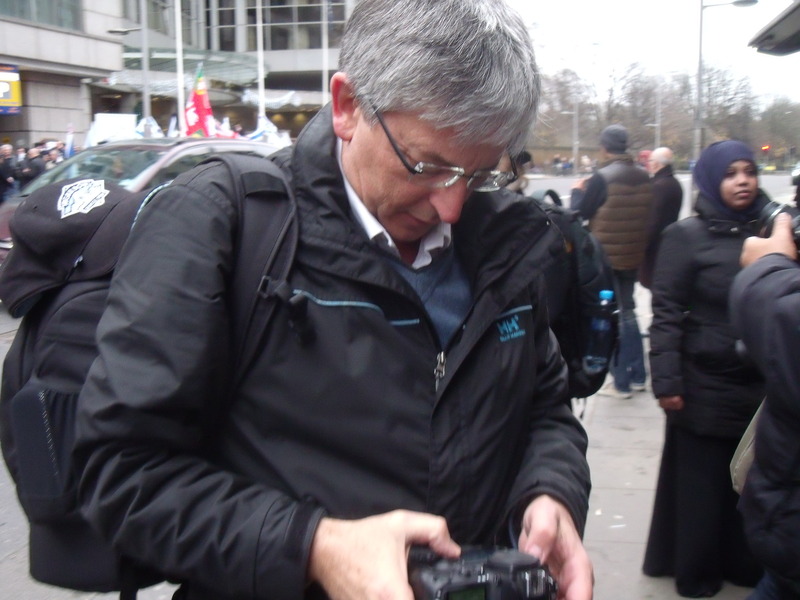 I might have been “in their faces” with my camera but then how is one supposed to film a political protest where there’s noisy traffic! 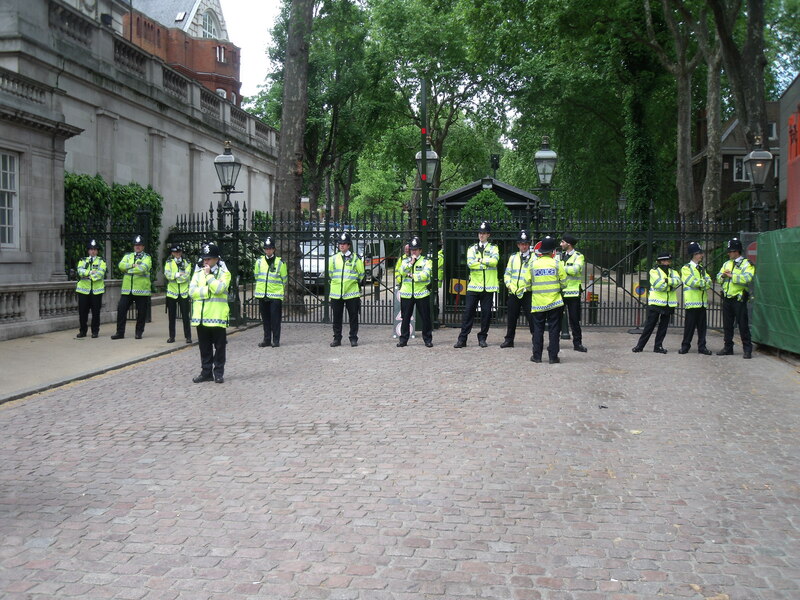 There is freedom of speech in London but no freedom to film that free speech! 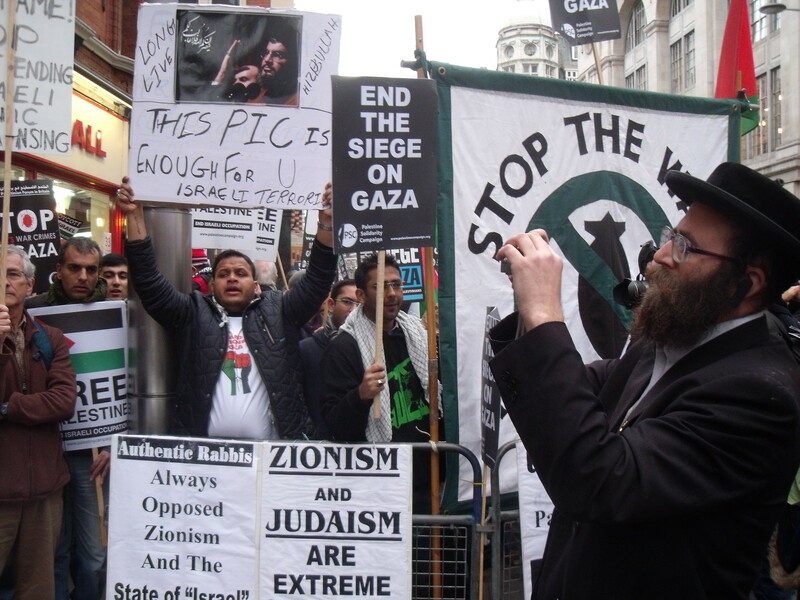 Surely, the Neturei Karta must get paid by the Palestine Solidarity Campaign to be so supportive of an anti-Semite like Nasrallah. But then, maybe, if ever Nasrallah’s Jew-killing dream comes to fruition he might spare the Neturei Karta and then claim to the world that he can’t be an anti-Semite as he let them live. 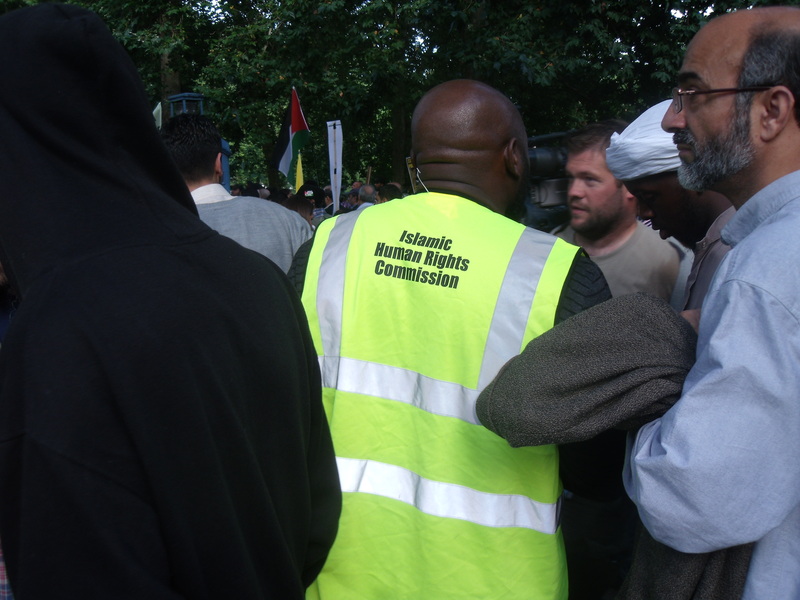 This is the Palestine Solidarity Campaign’s tactic when it employs the services of the Neturei Karta. It would be fascinating to know how much the PSC pays them. 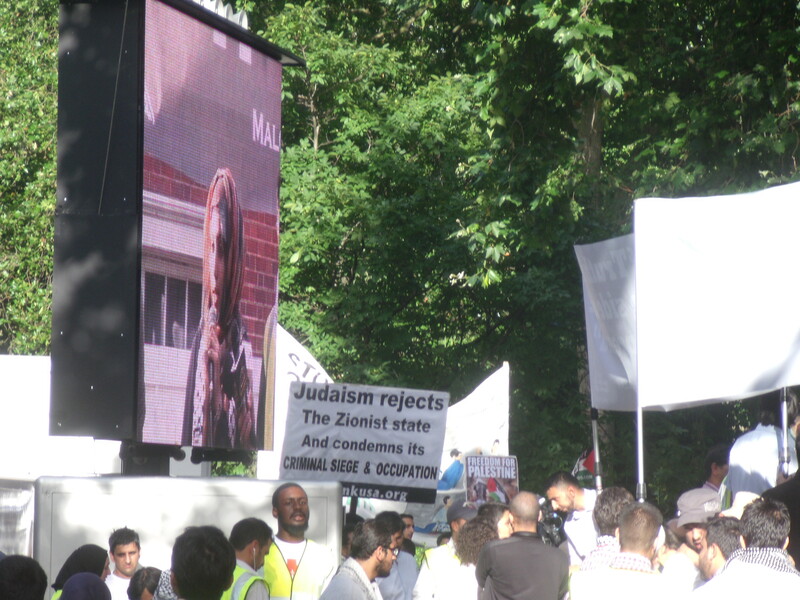 There was a small pro-Israel turnout of about 50, which was good considering the lure of the Brent Cross sales, Limmud and Eilat, but that was enough for the anti-Israel mob to direct their aggression at. 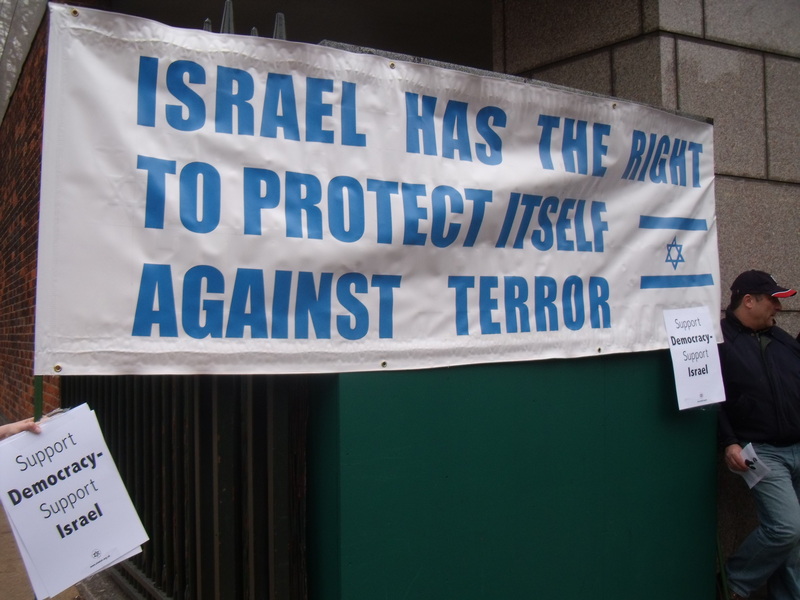 There was one huge sign opposite them which read “Israel has the right to protect itself against terror”, which didn’t go down too well. One of the questions the pro-Israel posse kept posing to the Israel-haters was “Where’s the church in Gaza?” But answer came there none. 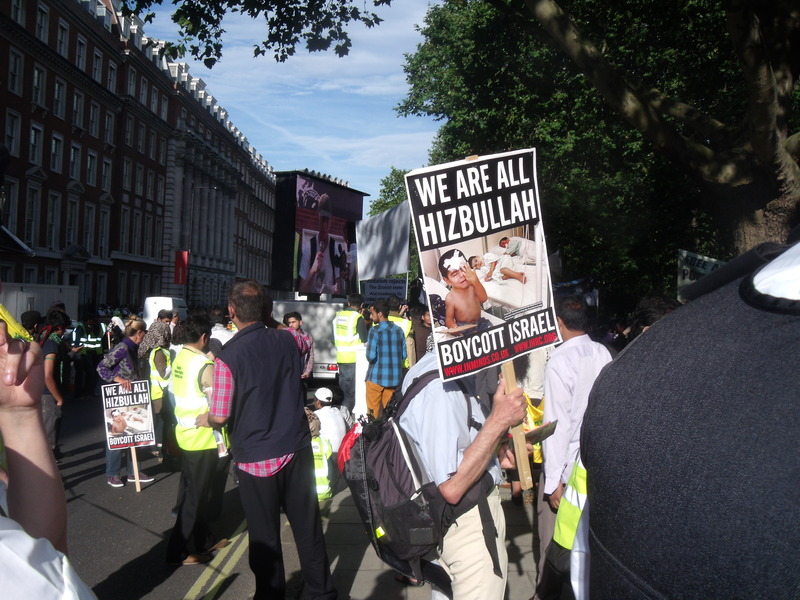 What I really don’t get is if you burn a poppy in the UK you will be guilty of “threatening, abusive or insulting behaviour” but it is, apparently, absolutely fine to call for Israel to be destroyed like Kozbar did today and like many signs did in Trafalgar Square in the summer. 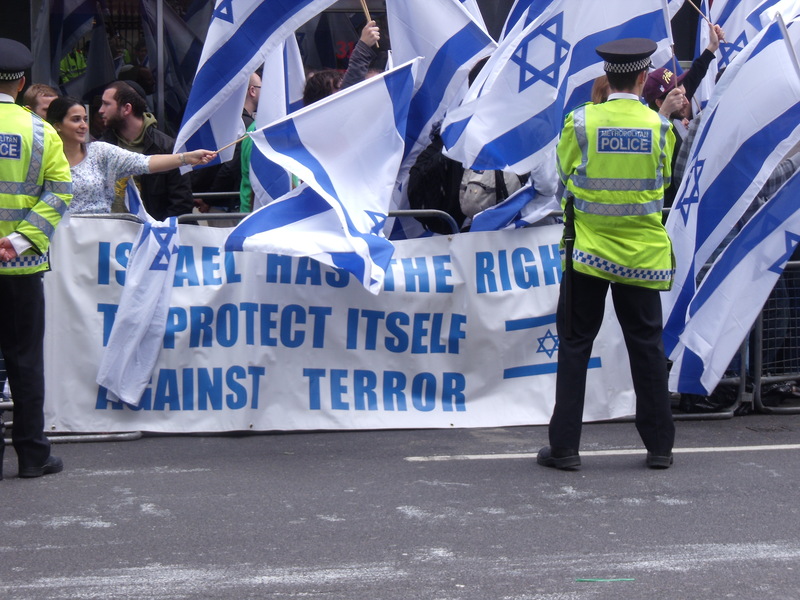 But such incitement will be allowed to continue until a British Jew or an Israeli resident or tourist is eventually attacked and killed (G-d forbid) on the streets of the UK. 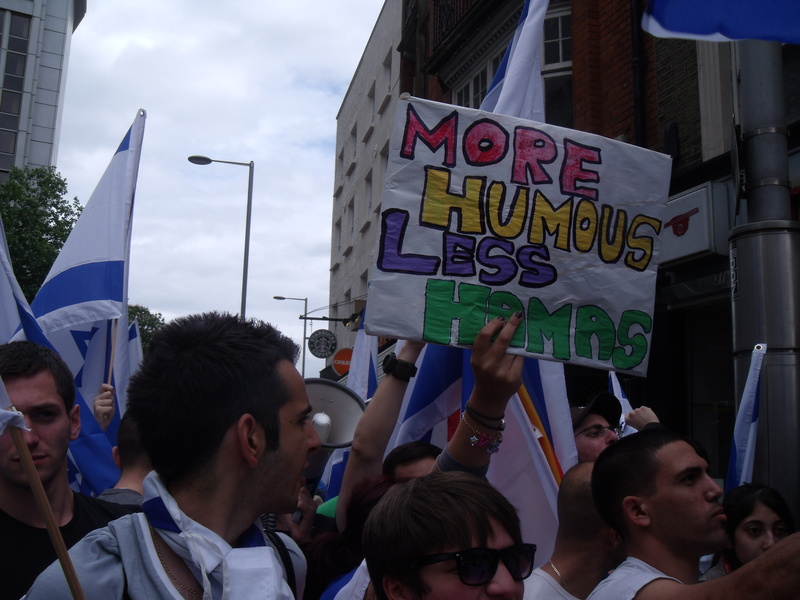 This was well-positioned directly opposite the anti-Israel protest. 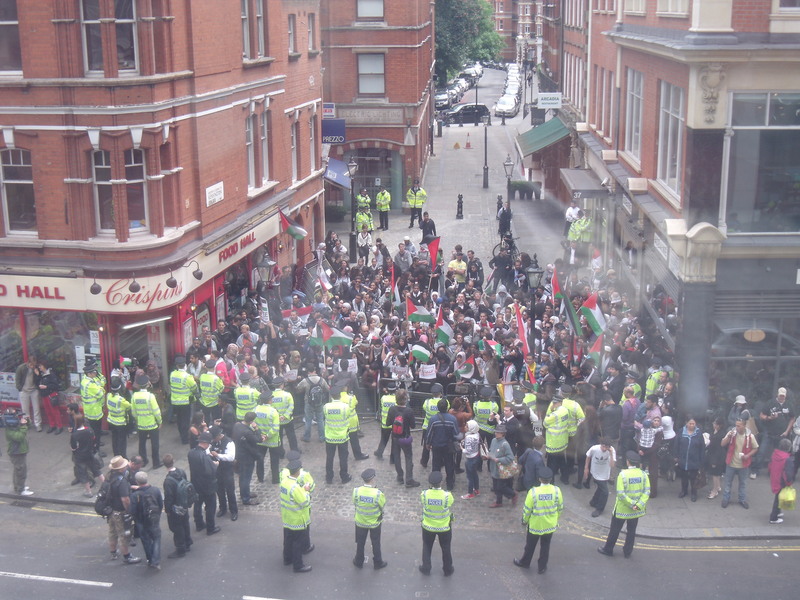 Watching the pro-Israel demo. across the road. 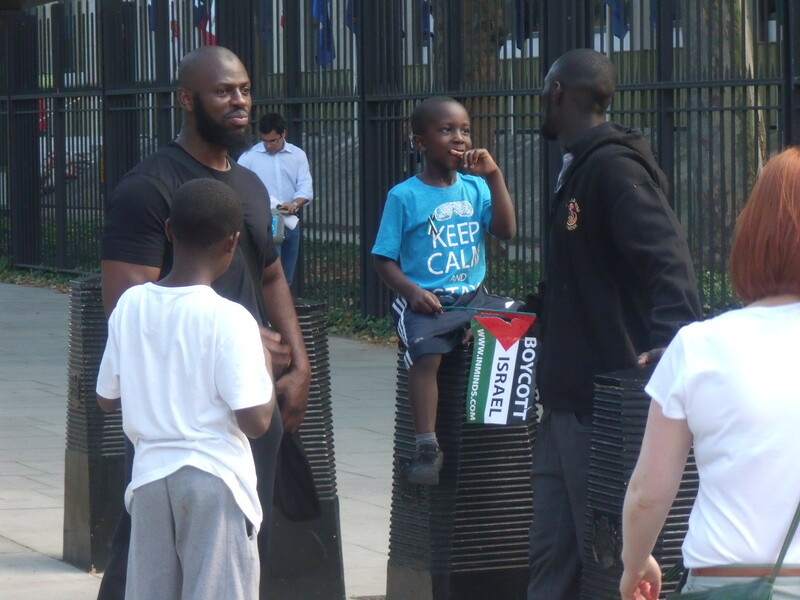 “Naqba Day” extremists spew hate outside Israeli Embassy. 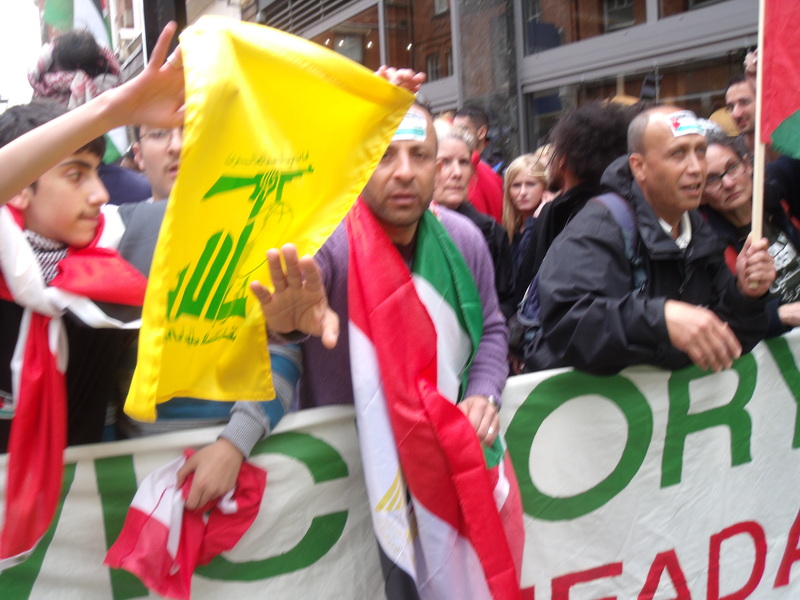 Hezbollah flag, with gun, on streets of London. It is testament to the power of propaganda that the Palestinians and their “supporters” still react with incredible rage to an event that never concerned them and that happened 63 years ago. 1948 was the Jewish Spring, when the Jewish people decided that no more would they subject themselves to the whims of societies that were less than welcoming to them. Pogroms in Russia, the Holocaust and being treated as dhimmi by Arab countries had taken their toll and by 1948 they had fought off British colonial rule in their ancient homeland and through the United Nations re-created a Jewish state in British Mandate Palestine that has been thriving ever since. 63 years later we finally have the Arab Spring, although it is turning into an Arab Slaughter with Christians now being attacked in Egypt and Libya and Syria massacreing their own people, the latter probably with the help of Iran. But in 1948 the Arabs thought they would massacre not their own people, but the Jews. But it didn’t happen. The Jews won. It was the ultimate insult for these Arab countries that had treated their own Jews as inferior subjects for so long. In response many Arab countries forcibly ejected their own Jewish populations. Around 900,000 Jews from Arab countries, who were indigenous, lost everything. Racist laws forced them to leave the Arab countries with nothing. Out of a Jewish population in Arab countries of about 1,000,000 pre-1948 only 5,000 remain now. It was an ethnic cleansing of the highest order. Yet, 63 years later instead of creating something positive the Palestinian national identity is marked by hatred and disaster. Their self-identity is based on little that is positive, but on what they claim has happened to them. It is a victim mentality of the highest order. “Naqba Day” is a symbol of their victimhood. 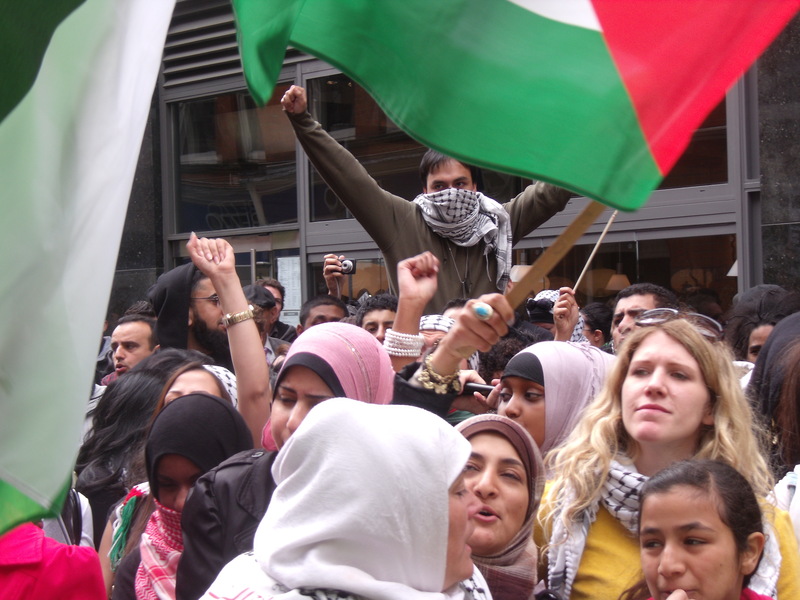 And so to London today where about 200 of their most extreme supporters called for Palestinians to get even more violent. 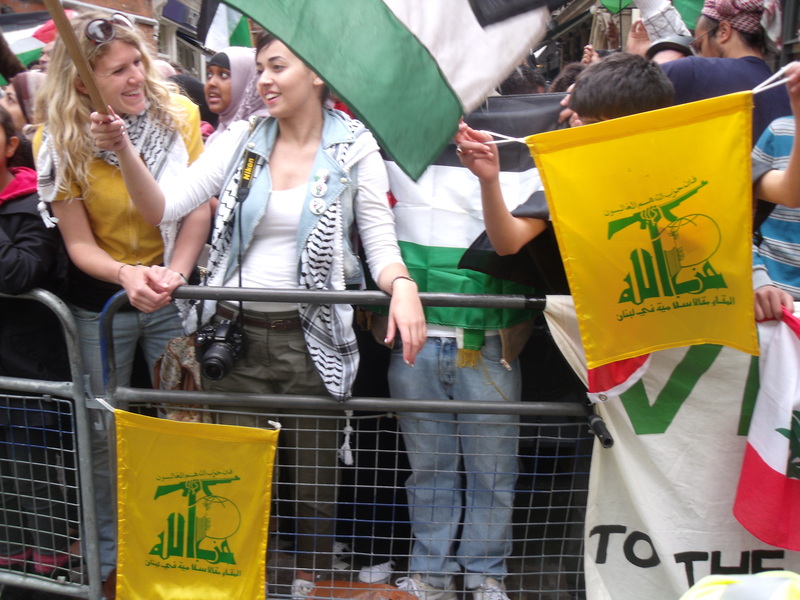 They screamed “Victory for the Intifada” and waved the Hezbollah flag with its AK47 gun on it. 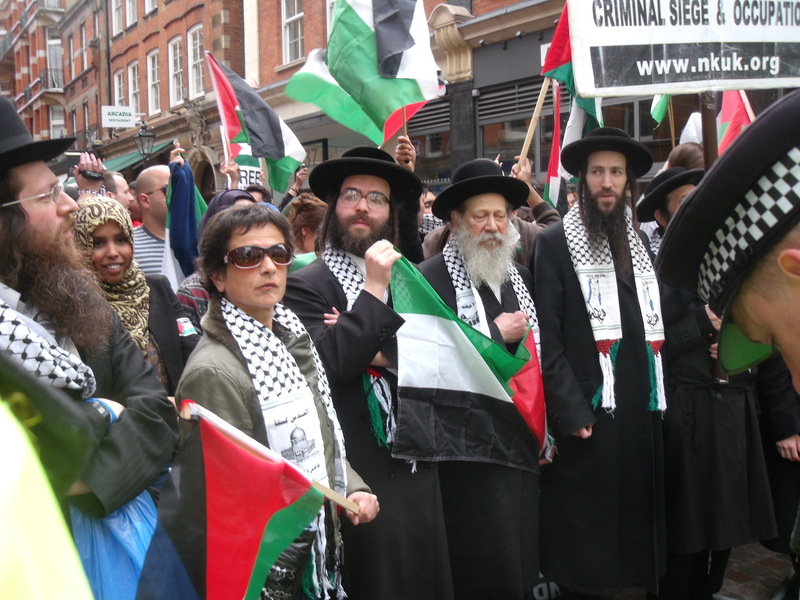 They called for jihad against Israel, called Israel a “terrorist state” and called for Israel’s destruction. 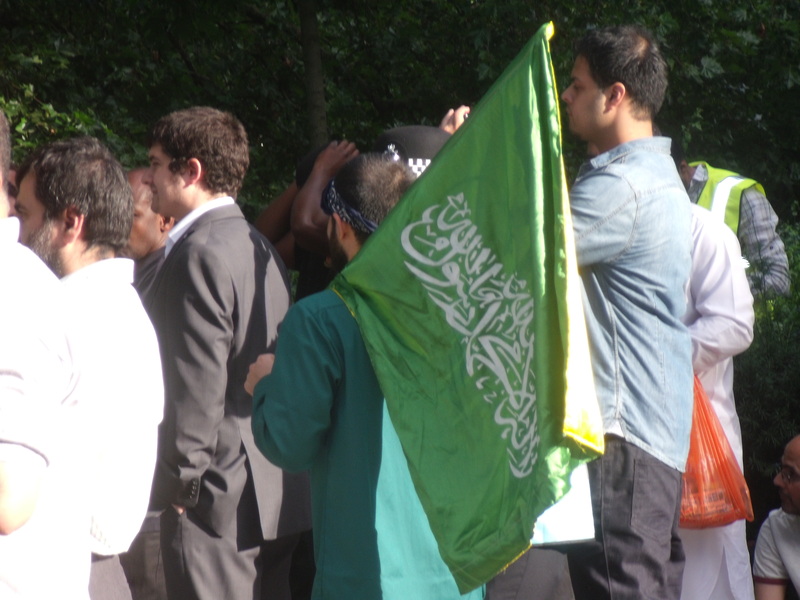 Goodness knows what they were saying in Arabic. Please let me know if you can translate the clips below. The Naturei Karta turned up about two and a half hours late to a heroes welcome. 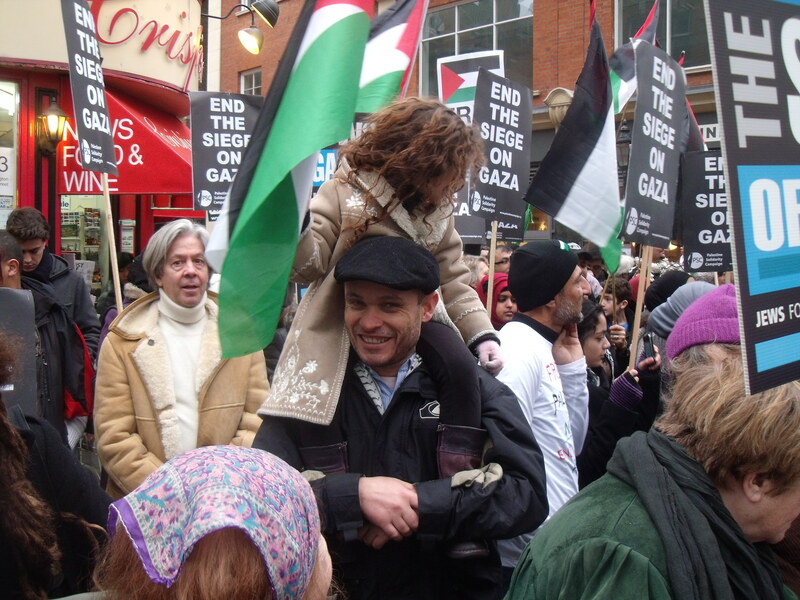 Children sat atop the shoulders of the extremist anti-Israel protesters; another generation about to grow up fed with lies and hate.